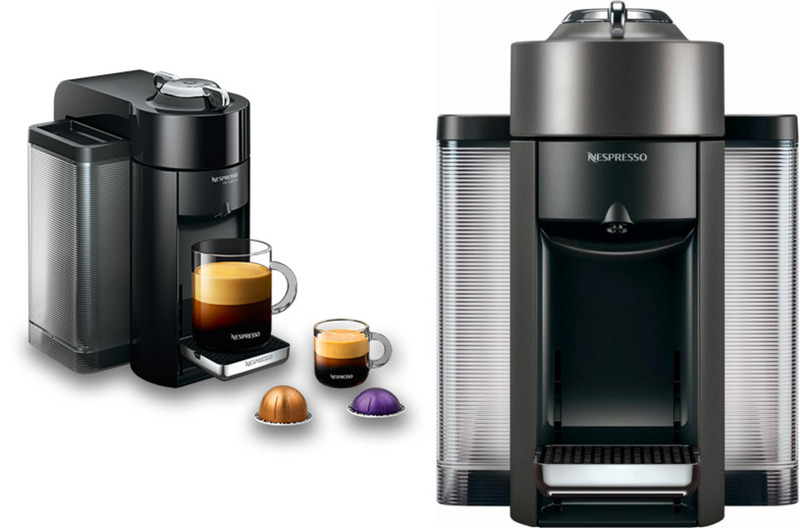 Nespresso Evoluo vs Vertuoline which one should you buy and how do they compare? Both the Vertuoline and the Evoluo were are departure from the traditional Nespresso range that had used the original capsules(originalLine). Both these newer espresso makers now use what is known as the Nespresso Vertuoline capsules which are not backwards compatible with the older models. The Nespresso Evoluo is the next generation Vertuoline. The Evoluo is available in two different models, the regular Evoluo and the Evoluo Deluxe. The Evoluo uses Nespresso's "Centrifusion" brewing technology. Centrifusion does not rely on pressure from a pump unlike previous capsule based espresso makers. Instead it spins the capsule up to 7,000 RPM as the hot water is forced through it. Spinning at this high a speed ​is said to produce help produce the foamy layer of crema that is usually associated with bigger commercial espresso makers that work off of high pressure steam. The newer Vertuoline capsules that are used on the Evoluo have a special barcode on them. The barcode is read when the capsule is placed in the machine. The brew time and strength is then automatically adjusted by the Evoluo to match the capsule. There are a few differences between the Nespresso Evoluo and Evoluo Deluxe. The Deluxe is basically down to the capacity of the reservoir and how many used capsules each can hold. Reservoir: Deluxe can hold 54 ounces whereas the regular Evoluo can only hold 40 ounces. The Nespresso Vertuoline is now considered a discontinued model. However, there does seem to be still a fairly large supply of these machines available to buy online. They have been succeeded by the Evoluo line above. The Vertuoline is essentially the same machine as the Evolue. In fact the Evolue is pretty much a straight up replacement for the Vertuoline with a few subtle differences. ​These differences are in the sizes of the machines and the appearances. The Vertuoline was the first to get the Centrifusion brewing technology. However there was a fairly popular complaint about how the Vertuoline brewed it's espresso. It had a very high crema level. Given the high crema level the underlying coffee was thought to be not quite hot enough for a lot of espresso lovers. This was not really an issue if you were using the espresso to make a larger drink such as an americano. Nespresso Evoluo vs Vertuoline how do they compare and which should you purchase? Well the decision is pretty straight forward. The Evoluo is the winner. Give the fact that the Vertuoline is now a discontinued model then there is absolutley now reason for anyone to purcahse it.